“We are not the ADA police, but we are here to promote accessibility.” — Larry Gorton, Vice-Chair of the grassroots disability rights group Access 4 All Spokane, during the dedication of the city’s first inclusive baseball field at Mission Park. This is a great step for people with disabilities in and around Spokane! 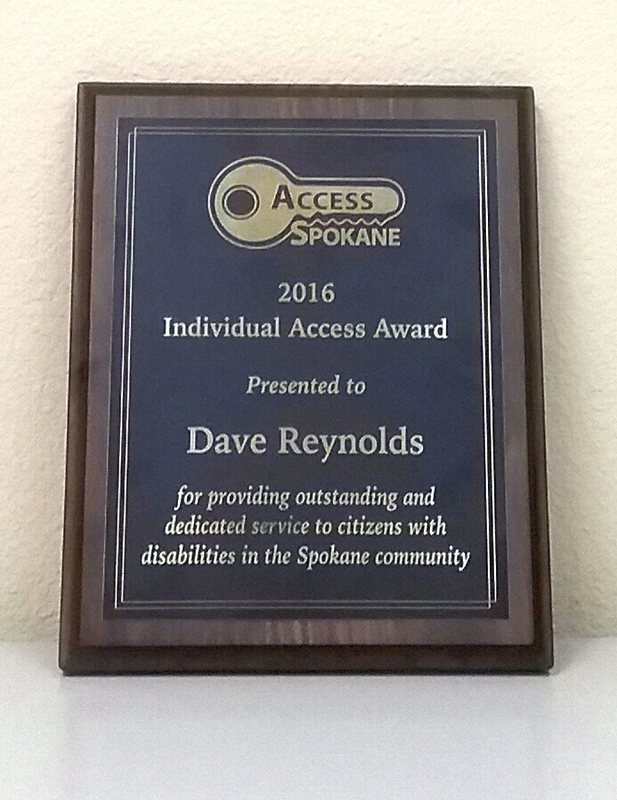 I am honored, amazed, and extremely jazzed to tell you that on Monday, October 3, I received the 2016 Individual Access Award from Access Spokane, at an event hosted by Spokane Mayor David Condon. “It is unlikely that anyone in our area that identifies as having a disability has not heard of Dave Reynolds. “Dave started with The Arc of Spokane as a Client Support Services Coordinator in 2008. In that capacity, Dave promoted opportunities to enhance the quality of life for people with intellectual and developmental disabilities and their families. 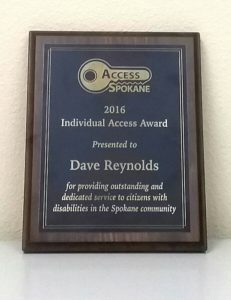 “In 2012, Dave co-founded Access 4 All Spokane, a group that ‘celebrates and encourages accessible and disability friendly places, services, and events’ across Spokane County. He has trained a team of Accessibility Ambassadors who provide no-cost accessibility evaluations of local businesses and government campuses. These Accessibility Ambassadors help places become more aware of the challenges people with disabilities might face at their locations. In one short year, 100 places have been evaluated by Dave’s teams of Ambassadors. “In 2013, Dave helped organize the first Spokane County Accessible Communities Advisory Committee, whose purpose is to ‘promote greater awareness of disability issues and improve access for, and inclusion and acceptace of, persons with disabilities in Spokane County’. This is accomplished in part by their advisory capacity with the Spokane County Board of County Commissioners and other local governments. “Dave goes out of his way to advocate for individuals facing challenges within our community. The person who nominated Dave for this award, Larry Gorton, certainly appreciates the time and effort Dave spent supporting Larry in his persistent efforts to have ASL interpreters available at city neighborhood council and community assembly meetings. By the way, they were successful in their efforts. I am grateful to Mayor Condon, and appreciative of the organizers of the Access Spokane Awards. Mostly, I am super grateful for my amazing friends with Access 4 All Spokane. It really feels awkward to accept this ‘individual’ award, considering that our work is such a team effort. I know they all would be telling me to get over myself already and accept the award. But, the truth is, none of this work could be done without their commitment, knowledge, expertise, and countless hours of work. Not to mention the personal advice and support they’ve given me, especially when things got tough. Thank you so much for all you do to make the world a better place for everyone!